Out and About | .Simons Says. When I got the email to participate as a speaker in Friday’s Leaders of Tomorrow conference, it was a no brainer to say yes. The view from where I sat at the panelist table was extraordinary – blank stares from 250 youth hailing from all parts of the Greater Toronto Area (GTA) had never felt so awkwardly good. But as I stared back at them, my secondary thought was “how do I reach these kids?” (It’s no secret that the teenaged bunch can be a tough crowd to not only capture their attention but to keep it) Unlike a few other speakers, I hadn’t prepared what I was going to say. I had decided the night before to just wing it and to speak from the heart, letting my words come as they may. And so that’s what I did. 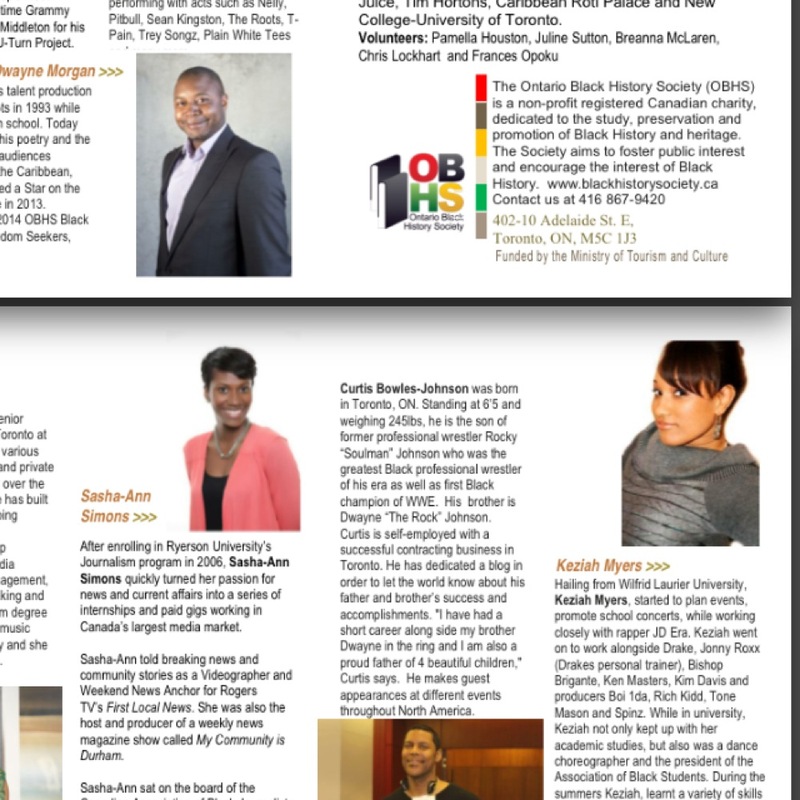 A little background: The Ontario Black History Society puts on the annual event. The kids ranged in age from 9th graders to those who will soon graduate. My session was the first of two for the day discussing this year’s theme: bursting the bubble in media, communications and entertainment. 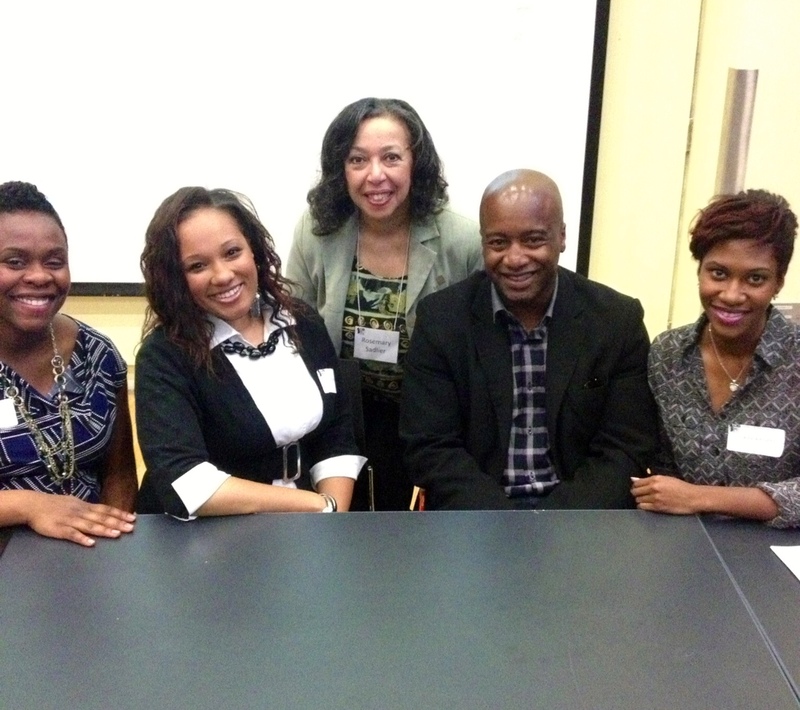 Their curious young minds wanted to hear our stories: how did we climb the ladder to success? 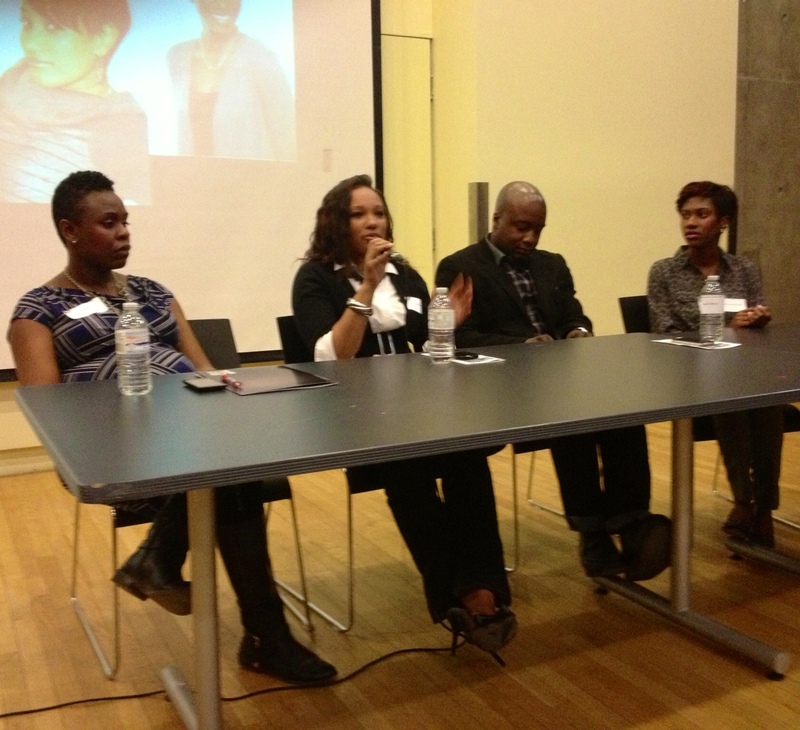 How did we overcome challenges, especially as the challenges relate to being Black in Toronto? How did we tailor our high school experiences to set us up for where we are today? How did we make it? The kids needed motivation and it felt like we four had suited up in our Power Ranger-esque outfits and showed up to our call of duty. Jokes aside, I struggled with the idea of portraying myself like I had “made it.” Because I haven’t. I have a ways to go before I can say that. However at twice their age, I do have a breadth of knowledge I can share – some advice I wish I had been told back then and some strategies and behaviours, which have worked out well for me thus far. So, you can bet, I talked to the teens about a pretty defining moment at the beginning of my journey in media. It was December of my first year at Ryerson University, and the week of final exams for the first semester. While you could find the other college kids chugging beers at pub night, I was at home sitting on the toilet. No, I wasn’t doing my business. I was frozen, staring at three little wands with plus signs on the floor. I was a whopping 16 weeks pregnant with my second child; the first was only months old at the time. To say this felt like a setback is an understatement. I was nowhere near my Journalism degree. Had barely started. Big. Huge. Sigh. Not from me, but collectively by a few of the kids in the audience. This panel talk just got real. My story is mine to tell, but I can’t share my journey without talking about the days of uncertainty and struggle. I was slightly worried about connecting with those kids, but once I began spilling the beans, I had their attention, alright. It was important I tell them how my tight-knit family and in-laws remained supportive of my baby girls and me. It was imperative I describe how I stayed focused, how I got involved in the community, how I juggled school and motherhood – and eventually became a career mom. We touched on other topics like appropriately handling racism on the job. I heard some more sighs as the panelists and I gave examples of some racially charged comments we had been subject to while on the come up. I’m hoping that’s the last time I’ll have to share those, as I’d rather they just go away. I chuckled a bit when one student stood up and asked something along the lines of how our Black community will overcome the whole “dark skin versus light skin” thing. It made me smile because I had just written about this. Judging by the lineup of kids wanting to chat at the end of the session, I’d say they were engaged and intrigued. I was incredibly impressed by the kinds of questions they asked and how it seemed they had really started to think about and plan their futures. I could see one young man’s hesitation to approach me, so I stepped over to him. He wants to become a music journalist, so we talked about some good schools to apply for. He then leaned in and said, “You know, I’m kinda glad you told us about your kids, because it’s something my cousin is going through right now. She should’ve been here.” That’s the reason I keep it real, because you just never know whose heartstrings you’ll tug at. It’s been a minute since I’ve been able to connect with a room full of students. It’s all kinds of awesome to be featured on a panel as a success story for hundreds of high school kids. Proud to be given the opportunity to share my journey and help answer some of their burning questions this Friday. Leaders of Tomorrow is an annual event that sees up to 600 Grade 9-12 students from across the GTA participate in a full-day of interactive presentations led by young role models. This year’s theme is ‘Bursting the Bubble on Media, Communications and Entertainment’. 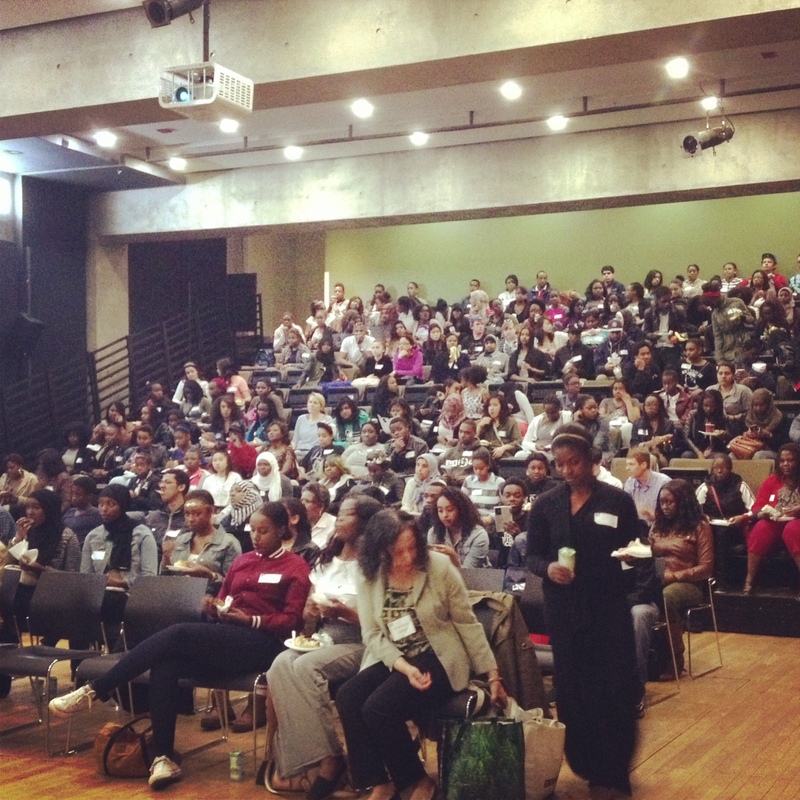 TORONTO, ON – May 6, 2014 – Leaders of Tomorrow (LoT) provides an intensive, engaging series of informative talks on a range of subjects connected to youth and the Black experience. ‘Bursting the Bubble on Media, Communications and Entertainment’ is the theme of the 2014 LoT edition. 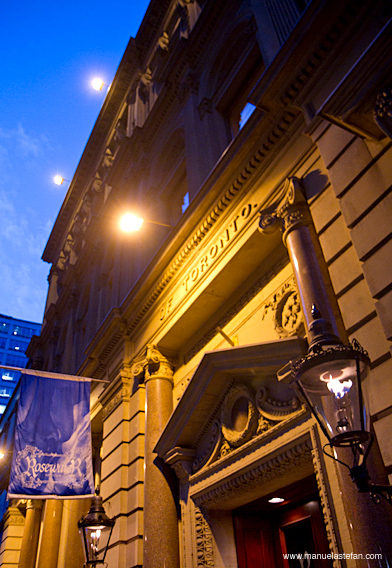 Students will learn from two panels, specializing in Media & Communications and Entertainment. They will be introduced to personalities from CBC and other media outlets. Actors, musicians and other entertainers will speak about their careers and education, and share their high school ambitions. 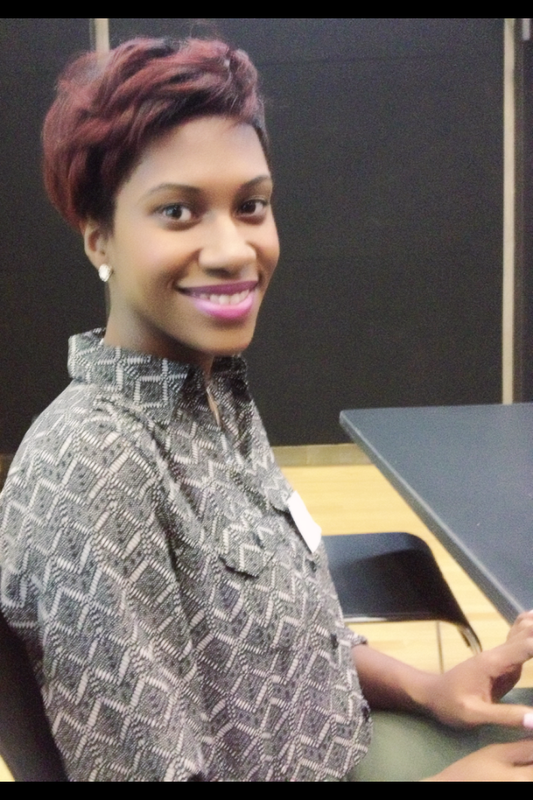 The 2013 edition ‘My Job is My Passion’ featured young, successful community members who shared their path to success. Students felt inspired, expanded their network, asked questions related to their post-secondary education path and much more. Featured panelists include: Emily Mills, Maestro Wes Williams, Sasha-Ann Simons, Alain P. Arthur, Sean Mauricette, Curtis Bowles-Johnson, Keziah Myers, Anne-Marie Woods, Jerzee “Tha Icon” and Dwayne Morgan. This engaging event will be hosted by Simone Riding-Cunningham. This year’s event is presented by the OBHS and made possible in part by our community sponsors: Booster Juice, Grace Kennedy, Pizza Pizza, Fred’s No Frills, Tim Hortons, Patty King, Caribbean Roti Palance and New College-University of Toronto. Special draw provided by Maple Leaf Sports and 3M. DATE: Friday, May 9, 2014 from 10:00 am to 1:30 pm LOCATION: William Doo Auditorium, New College 45 Willcocks St. Toronto, ON M5S 1C6 Attendance: Over 200 students registered to attend this event. Registration is now closed. If you had taken one look at me on Friday night, you’d have told me to sit tight on Saturday morning. I had been beat down, yet again, by allergy symptoms, all showing up at once. I hibernated in bed, looked disheveled while wearing my “I’m sick” hoodie – you know, that old, yet super comfortable hooded sweatshirt we pull out of the closet when we’re under the weather, and my body felt like it was falling apart. But as down as I was (and as much as I wanted a refund for my immune system), there was not a speck of dust or a whiff of pollen that would keep me away from those Saturday plans. Enter: The BeYoutiful Project – the first in a series of community outreach initiatives created for women that are disadvantaged by social or economic circumstances. April 26 was the day that a little idea birthed from one woman named Gina Pomone became an awesome reality for 17. Pomone founded and organized the invitation-only spa slash boutique. The special guests were referred to her by various non-profit community groups. 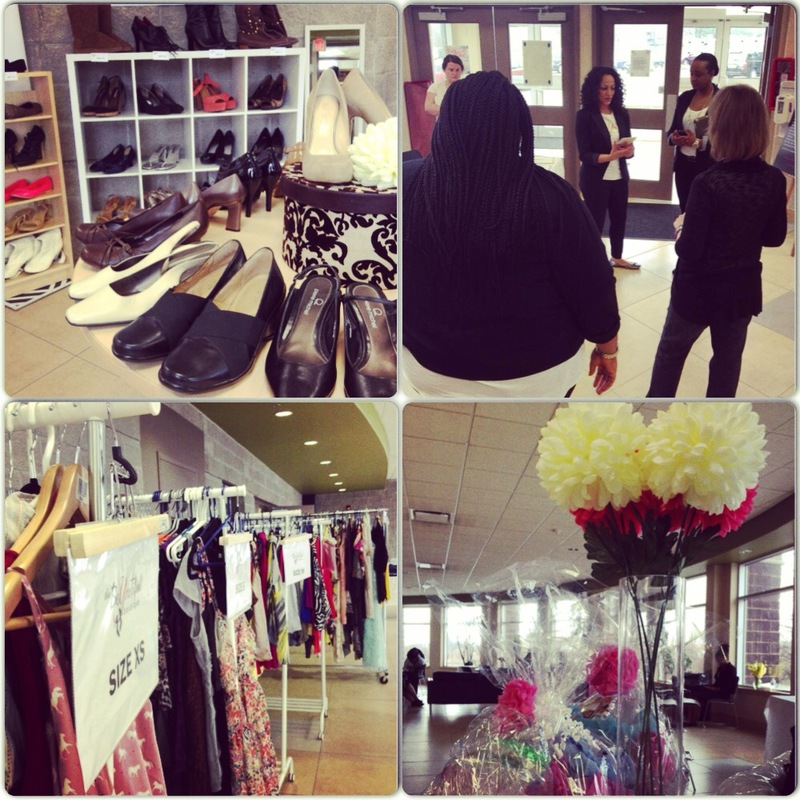 The BeYoutiful Boutique she created was their chance to finally de-stress. The ladies indulged in some shopping, for items from clothing to shoes and accessories, got manicures, mini makeovers, and enjoyed sweet treats during the afternoon tea. After months of hard work, preparation, and a generous helping of donors who gave money or purged their closets, Pomone’s dream had come alive. 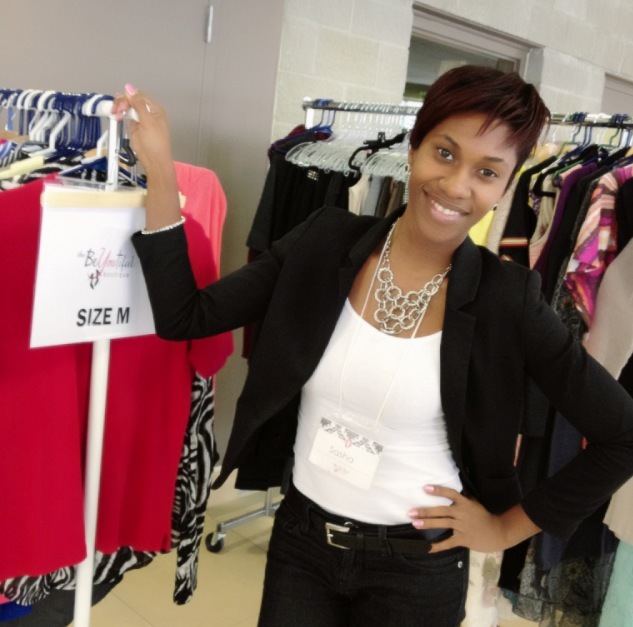 I volunteered as a Fashion Stylist, spending an hour each with four of the women, and hand-picking the perfect outfits. The vibe was something else. 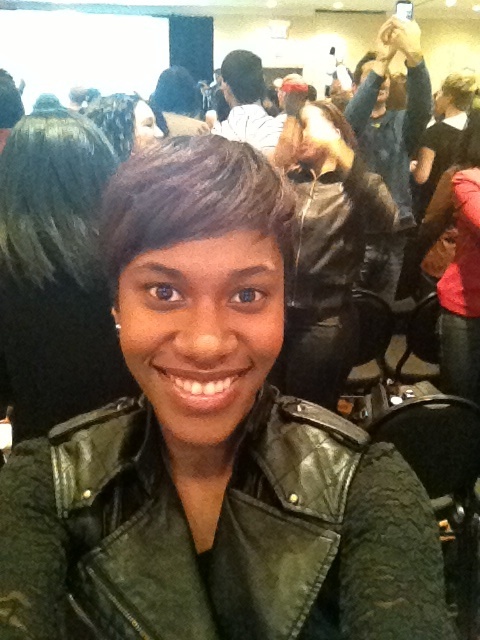 I hadn’t felt that much positivity and encouragement in one room full of that many women, in a long time. (Shout out to the handful of men who were also present and instrumental in helping us set up) Our emotions ran high; we were nervous, we laughed, we cried. There wasn’t a dry eye in the room when Gail stepped out of the fitting room wearing a pretty black-and-white dress, something she hadn’t worn in more than two decades. Let me take it a step back: she walked in wearing her favourite winter coat, but it wasn’t by choice, it was her only coat. The one Gail could afford 24 years ago, and was proud to show me still had all its buttons in place. She was dressed in what she called her style, two-layers of jogging pants and a grayish-black t-shirt. What truly brought on the tears was the moment her daughter Christine, who was also a guest, walked out of the change room next-door, laid eyes on her mother twirling in a dress and gave her the biggest hug. You could tell she hardly recognized the woman who had raised her. They stared at each other in a loving embrace; Gail couldn’t get over the fact that Christine was wearing heels, and neither could stop laughing at how strange but beautiful it was to be rocking posh pink lipstick. The day of pampering was a success. Our guests looked and felt beautiful. They were truly happy. It was well deserved. Next time I’m having one of those days, I’ll remind myself how easy it is to make the choice to be happy, to feel good about myself, to feel beautiful. It starts within. Even a bad case of allergies shouldn’t ever be strong enough to knock me off my mental track. I played a small part in helping those women take time for themselves and recognize their own beauty. But socializing with them did a world of good for me, too. We were all winners on Saturday. Get more information on The BeYoutiful Project, right here. He walked on stage at the Sheraton Hotel in Richmond Hill, Ontario to a standing ovation, lengthy applause, and the sounds of a Hip hop bassline muffled in all that clapping. It’s nothing short of what’s expected for a man whose name has created this much buzz. 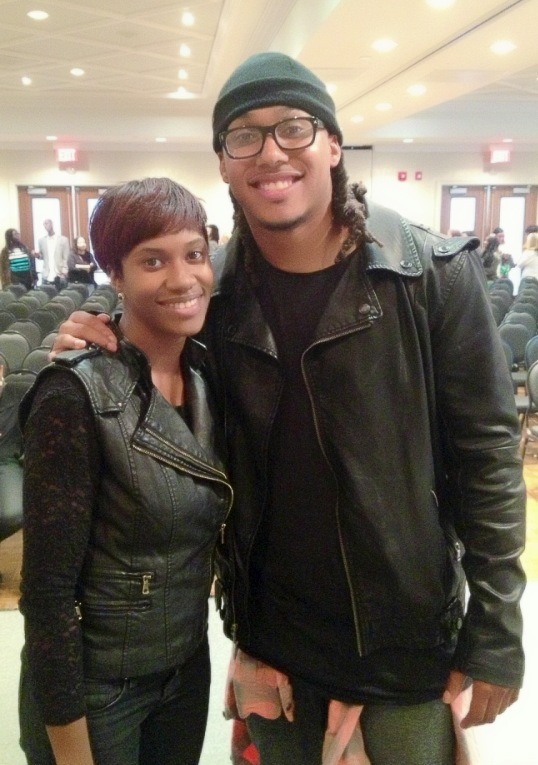 Rehab Time holds an enormous presence on social media based on Trent Shelton’s words of encouragement alone. His 2-minute YouTube videos are contagious. His catch phrases are – catchy. 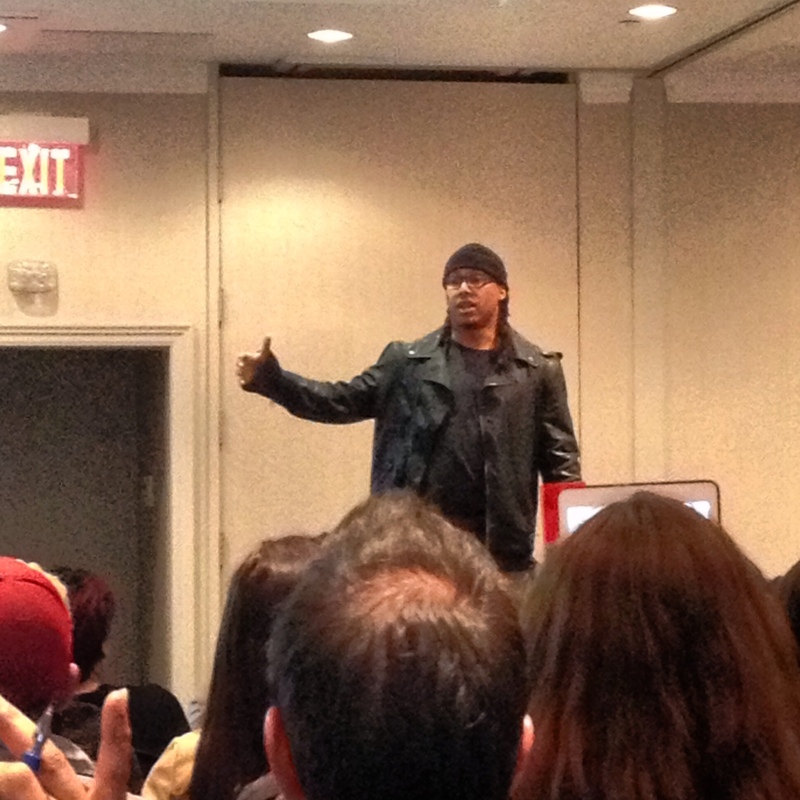 Trent Shelton is a treat to watch and listen to. He’s considered by many as the top motivator in the world, under the age of 30. However, the former NFL wide receiver says he has led a normal life. Shelton turned his pain (he was once diagnosed with depression) into passion. He reminds us: “I’m just like you.” And I think I believe him. The more this Christian man believes in God, the more I trust in him. The more he gives the honour and glory of his accomplishments to Jesus, the more intently I listen to Shelton’s teachings. He says he doesn’t boastfully quote those Bible scriptures, but that he strives every day to be about that life. I believe that what has happened for Trent Shelton, can happen for you and I. Success. But not the rock-star kind, rather the kind that changes lives and leaves behind a legacy. I’m at a point right now, where he has been already – and it’s that moment where you begin to realize what you’ve been called to do. I’ve been all the way through school, earned top grades, a degree. I steadily hold down a 9 to 5. I’ve birthed two human beings and raise them daily. But my heart tells me there’s much more to my story – that I have the power to change and affect (other) lives. And though my destiny is still a bit fuzzy, my vision today is the sharpest it has ever been. Understand that you are not your past. As you grow, people like to remind you of who you used to be and bring up what you used to do, but you can’t let that stop your growth. It’s often people who know the least about you that have the most to say. The same can be said for those who have never taken the time to understand what you’ve been through. Keep your circle small. 3) Commitment = staying loyal to what you said you were going to do, long after the mood you said it in has left you. 4) Anchor your actions in greatness – so daily, you produce nothing less than your very best. Consistency is key. When you’re consistent then you’re reliable. When you’re reliable then you’re trustworthy. Have faith, even when you don’t truly believe. Everybody wants you to do better, be blessed, and be successful…until you’re better, more blessed, and a little more successful than them. You are your own competition, no one else. Be loyal to yourself. Be loyal to God. A journey is made up of small steps. Stop quitting on friendships and relationships, simply because things got difficult. Remain disciplined. Discipline is not simply saying ‘no’ to the things you hate, it’s saying ‘no’ to the things that don’t get you the ‘yes’ you are after in life. This is Shelton’s catchiest phrase. A simple reminder to have faith, have patience and to trust in God. Just Take The Compliment, Will You? So, apparently it’s a “thing” that 20, 30 and 40-somethings pack it up at the end of a busy Thursday at work and head to the elegant Rosewater (supper club) in downtown Toronto. Happy hour they call it. I’d heard of this happy hour in the past, but had barely come close. Until now. I’m sure you can tell, I don’t get out much. But on Monday, when my girlfriend Michelle invited me out for a Thursday cocktail, this self-proclaimed social butterfly was already visualizing her outfit, shoes and hair for the night. Then somewhere between Monday and Thursday, I came back to Earth and realized this really wasn’t going to be a big deal. We narrowly escaped a pair of bald-headed bouncers asking people to wait outside and form a line. The room was packed. My dress was cute. But cute as it was, not too many eyes wandered from the half-tipsy conversations that were already well underway. It seemed like many of the “suits” and “heels” in the room had known each other; perhaps they were regulars at the lounge. Awkward moment #1: pathway to the bar. I’m 5’2” and a half (yes, I wore flats) and weigh none-of-your-business, under 120 lbs. Crowds don’t move for me. Nobody moves out of my way. Ever. I don’t know who your girl thought she was offering to go get our drinks, but I was feeling myself. At the counter, I got ignored, as usual. Bartenders pay me no mind when I’m standing between a bunch of large men and pushy females. 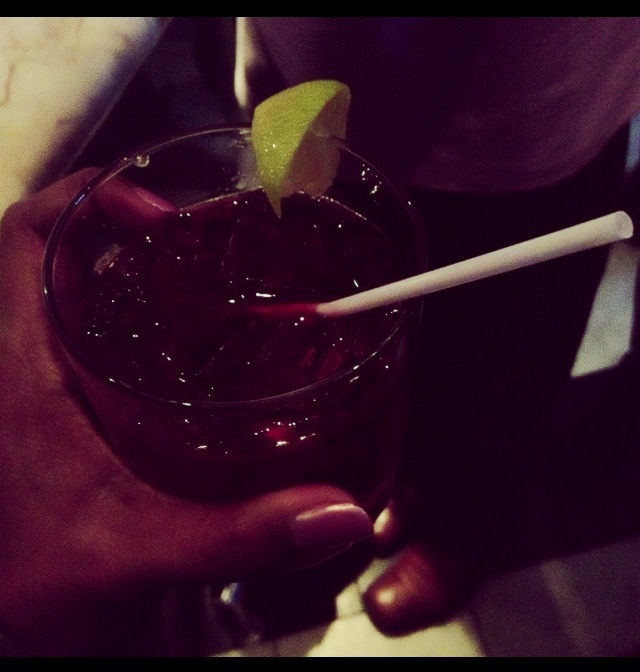 After about 9 minutes, I got my Cranberry & Vodka. Must have been my dress. Michelle said her hellos to a few people she recognized and we found our spot for the night. Awkward moment #2: compliment fail. I was chatting it up with a group of IT recruiters who work at a firm down the street. One male in the crew, who had guzzled more than a few drinks, had a barrage of questions for me. He was curious. Liked what he saw. Pedro flattered me with praises, from how pretty I was to how proud he was of my education and accomplishments so far. “Oh please, I bet you say that to all the ladies,” I replied. The way his eyes widened after that, is something I won’t forget for a while. “Are you serious? Gawd, what is your problem, girl?” said Pedro. What he did next makes me think in hindsight that he deserved a swift box (a Jamaican-style slap) in the face. More than a few beers in him, so you know he was LOUD. His back was turned to me at this point; guess that meant I was dismissed. I wasn’t gushing with pride as he loaded me with compliments. I suddenly became the angry Black woman. And he was such a damn drama Queen with his delivery, too. Happy hour sucked. I went through the motions post that comment. I circled back with Joseph and Angie, whom I had briefly met a bit earlier. Can’t even tell you what we talked about. Pedro’s words stung, and by 7:30 I could hardly pretend anymore. I glanced over at him, standing in the same old spot at the bar counter, another female by his side, another drink. Michelle gave me the nudge and I was ready to leave. I guess I could’ve said thanks. He’s lucky I didn’t tell him he was full of crap – expressing the fact that I didn’t believe him was my gentler way of turning him down. But how that turned into a public declaration of my unluckiness in love, I’m still trying to grapple with. “Who does he think he is embarrassing me like that?” I thought. His actions reminded me of a chauvinistic pig. He should have known better.